Collaborators Marisa Clementi, Pareena Lim, Rebeca Medina, Emily Moore, Jules Skloot, and Saúl Ulerio and I have been putting into action a relational practice that grows from conversation, trust, togetherness, disagreement, and dissent – a practice of being together through body and voice. Tidal is a collision of our future bodies with song. I have written music that traces points in my lineage, some recent and some distant or barely imagined. These are the bones that hold our landscape together, crooning, clamoring polyphony, swelling and disintegrating all at once. 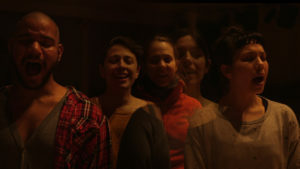 Music and Direction by Tatyana Tenenbaum. Cartography by Rebeca Medina. Lighting Design by Kathy Kaufmann. My collaborators and I pay​ respect to Lenape peoples. We acknowledge that our ongoing work here is situated within Lenapehoking, the Lenape homeland. We pay respect to Lenape land, water, and ancestors past, present and future.